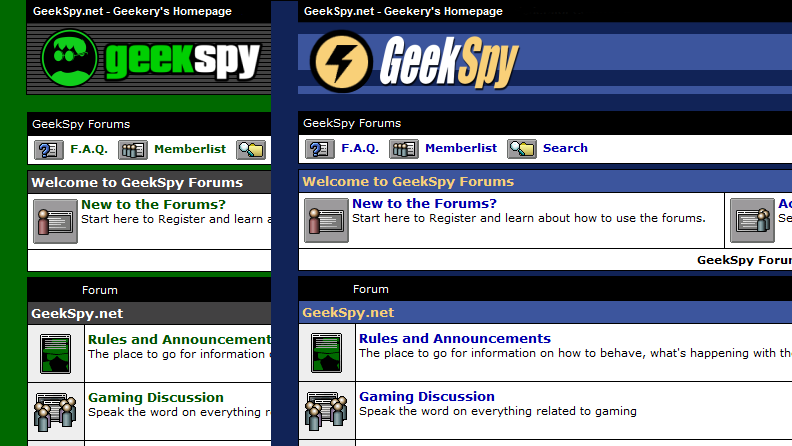 This is a forum I've set up which looks suspiciously similar to some older forum software that no longer exists. I'm considering the old ForumPlanet design to now be abandonware, since it was obsoleted back in 2007 by some other software which is now, as of 2012, obsolete itself. Basically, I've made it for a bit of fun and nostalgia. Since the underlying forum software is different, not everything looks 100% accurate, but it's as close as I could reasonably get it. We also have a few features that ForumPlanet didn't have back then, such as multiple-choice polls, setting your own timezone, and a moderator system that works. Excessive profanity. I don't mind it, but remember that some people might be browsing from work or other places. Keep it minimised in topic titles at least. Image posting. Some forums might have image posting enabled. Keep it tasteful, again, remember people might be browsing from work. Linking to Nasty Stuff™. Shock sites, hateful stuff if it's directed at someone, you know what I mean. Other than the above, just remember to play nice and keep it legal. You've all been on forums before, I don't think we need to go through all the basics on spamming and flaming and stuff. A few board settings and the like which you might find helpful. Avatars can be customised straight away, and uploads are currently limited to 60x60 and 40kB. You can also select from all 74 original ForumPlanet icons in the gallery, if that's more your thing. While avatars can be customised straight away, the rank settings are currently set to mimic those of the old GameSpy Forums. Recruit, Trainee, Low Level Operative, and Covert Agent. 200 posts gets you the ability to set your own title in your profile settings. You can choose to change the board style to the ForumPlanet forum you were most familiar with. So far we have GameSpy, 3D Action Planet, and Planet Black & White. If we get any groups of old-timers from other forums, I am open to adding more. You can change the style in My Profile -> Board Preferences. That's all I can think of for now. Everything written above is open for discussion in the Feedback forum, and I imagine settings and guidelines will change as we move forward.